Scripted by Gulzar and narrated by Amitabh Bachchan, the show has mesmerizing music from lead singers Ustad Sultan Khan & Shubha Mudgal. Amber holds the history of a citadel, pulsating with a legendary past of 600 years and 28 kings of the Kachwaha dynasty. The show ends the silence that fell upon Amber after the capital moved to Jaipur and it attempts to revive its pride. It brings forth the traditions that colored the lives of its people and the pomp that once existed in its fullest form so that the spirit of Amber continues to be eternal. For the show, you will be seated in the open Kesar Kiyari complex surrounded by water on three sides. 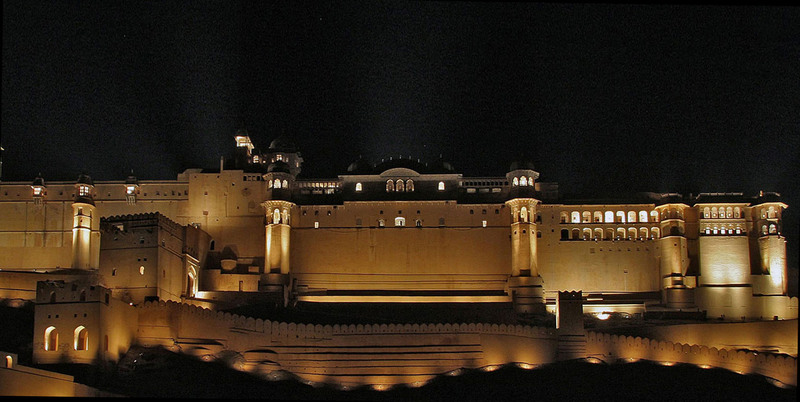 In front, a panoramic view of Amber Fort, the rising Jaigarh Fort will be to your left and hills all around. An audio guide is also available at this monument. The show is held at Kesar Kiyari, on Maota Lake, at the foot of the Fort. If you are driving, look for signage for the show. It will direct you to turn into the complex when you are close. If you have a chauffer driven car, you can be dropped to the entrance and show foyer; if you are driving yourself, you may have to park the car and then walk to the venue (about 10 minutes.) It is therefore advisable to reach at least 25 minutes before the show timing. The seating is outdoors with water surrounding you on three sides. Please carry something warm to wear, it tends to get cold around the winter months. If you are arriving by public transport you may want to plan your return trip. 90 minutes is a comfortable time for your bus or taxi to be waiting. Photography, video or audio recordings of the show are prohibited. Please avoid carrying such equipment. A fabulous presentation through light and sound. A captivating show giving the flavor and beauty of Rajasthan. Just great! Thank you and go on like this! What a spectacular show. It really connected us to our rich heritage and history. Wow. Kudos to the entire team.